Attractive blonde-wood chest is the perfect accessory for storing your favorite teas. 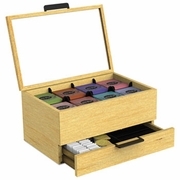 Holds up to eight different kinds of tea bags. Transparent topped lid allows for easy viewing. Made with real wood and brass handles, sleek chest presents a modern take on traditional design. Enough space to vertically stack up to 16 individual tea bags. 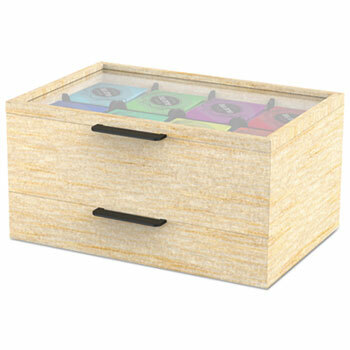 Handy built-in bottom drawer provides space for condiments and stirrers. 13 1/5" x 4 2/5" x 10 2/5"